A configuration known as a double Cardan joint drive shaft partially overcomes the problem of jerky rotation. This configuration uses two U-joints joined by an intermediate shaft, with the second U-joint phased in relation to the first U-joint to cancel the changing angular velocity. In this configuration, the angular velocity of the driven shaft will match that of the driving shaft, provided that both the driving shaft and the driven shaft are at equal angles with respect to the intermediate shaft (but not necessarily in the same plane) and that the two universal joints are 90 degrees out of phase. This assembly is commonly employed in rear wheel drive vehicles, where it is known as a drive shaft or propeller (prop) shaft. 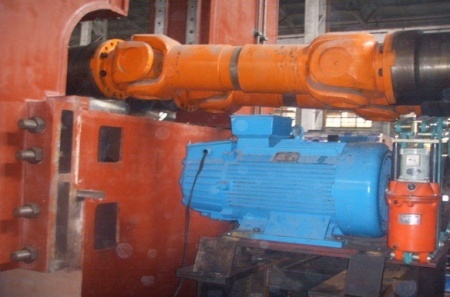 Even when the driving and driven shafts are at equal angles with respect to the intermediate shaft, if these angles are greater than zero, oscillating moments are applied to the three shafts as they rotate. These tend to bend them in a direction perpendicular to the common plane of the shafts. This applies forces to the support bearings and can cause "launch shudder" in rear wheel drive vehicles. The intermediate shaft will also have a sinusoidal component to its angular velocity, which contributes to vibration and stresses. and it is seen that the output drive is just 90 degrees out of phase with the input shaft, yielding a constant-velocity drive.